Do you want to see the half dolls I could not live without? I haven’t dressed them yet, but that’ll come. These are created by an artist named Kathy Redmond. I understand she did quite a lot of these slip decorated dolls. To me they are a cross of china head dolls, half dolls and Dresden dolls. They are just wonderful and I had never seen this artist before. When I saw them the first time, I was mesmerized. I just stared at them. But I did walk away. On Wednesday when they were both still there I did not know what to do. Truly, I loved them both and could not make up my mind. Therefore; I bought both. I do not regret it. And as for the whole budget we talked about, at the end of the week, I only went over 200.00. Not too bad, huh? It seems I have some disbelievers out there! You might not believe that I really completed my Papeterie Project. Michelle wanted a bigger picture for the article and not a borrowed one of the class prototype. So, to kill the proverbial two birds with one stone, I am proving that I finished my little letter box AND have bigger pictures of the project. Michelle said she was a bit jealous as well. But here is my completed project. I’m back with some more convention news, kind of like a diary isn’t it. Well, I got to be in Sherrill Williams’s workshop and we made a Papeterie. (French, a little letter desk.) I have borrowed the picture again from the convention to attach to this as the kits were made up and mine looked EXACTLY like Sherrill’s. Well it did! She did the kit and there was no way to fail, and yes, I did finish it, in my room later during my sewing and quiet time. Thank Goodness I scheduled those, too. On Tuesday evening I had chatted with hubby and we discussed how the money was holding out. “Well, thank you, except well, my friends and I have had really different schedules and I didn’t plan to, but if there is room in the luncheon I would like to go to a paid luncheon and join them on Friday. And I am going back to the National Doll Show tomorrow as I have scheduled time. There were a couple of places I didn’t know about and I want to check them out. And maybe I’ll see if a doll is left. It’s the last day of the show.” I assured him I had enough money to do what I needed and do my tipping when I left, etc. etc. So, completing my Papeterie workshop I headed down to registration to see if any space was left in the luncheon, called “Girl with the Pearl Earring.” Interesting! The gift was a surprise; no one knew what we were paying for other than lunch. Well, I got into that and reported back to the other members at large from here that I meet once a month. Quickly, run to my room and catch the bus back to the National Doll Show. It would be closing at 7.00 PM (though we were told it was at 5 PM) Why I worry about such things I will never know but I did have to get back for pictures. My assigned times were 6-6.30 for the competition room and 6:30-7:00 for the Special Exhibits. Once again, I digress. Off to the National Doll Show I went. I finally sat in the heat and waited 45 minutes outside for the bus. No one was going to even drag me into the hall of temptation. I had broken my budget and had to pay the piper. I went back to the hotel, charge receipts in my wallet, dolls wrapped in my purse, tee-he, tee-he, big grin on my face and cooled off. I went to supper and met more friends. Friends who understood the trying events of the day, and how easily it is to give in to temptation and truly believing that if those dolls were still there on the last day, it was MEANT TO BE! I went off to take my pictures, stay tuned. Yes, the food was delicious. I ate the whole hamburger AND the fries. I managed to blow the budget and the diet all in one day. Well, Fiddly-Dee tomorrow is another day. p.s. by Michelle: Did I tell you I was seriously jealous! I know, money is a dirty little subject, but I think it isn’t chatted about enough. People who have it are guilty about it, and people with almost enough want to keep their mouths shut and people without much at all don’t want to be shunned. Well, I am in there with the whole group and not the group with piles of it. I knew that going to this convention would place me with ladies (and gentlemen) with far more disposable income than I could imagine. But that did not stop me from going. First it was close enough to drive, and the gas was cheaper than an airplane flight. I checked the room rates, the parking rates, the food rates, and the local taxes, and calculated that it would cost me about a thousand dollars to pay for the room. (I choked, too.) Then I knew I would want to spend about a thousand dollars, at least. That sounds like a lot, but you can spend a thousand dollars really fast at a convention, if you don’t have some rules. Those I am getting to in a minute. I saved for this convention for TWO, count them, TWO years. I had the money, cash in hand for this trip. I didn’t inherit it; I worked for it and saved the money. Twenty dollars here, fifty dollars there, and I said no to myself several times for things I really wanted to buy. That money went into the fund. You can do it too! I have an acquaintance who loves to go to the guild school every year. (She treats it like a Christmas club account, every month 1/12 of the cost.) (www.IGMA.org). You should pay yourself like you would pay a bill. Focus your intent – This convention shopping was focused on fabric. I knew I wanted larger pieces to make clothes for my Ultimate Fashion ®. She is 12” tall and to make a dress with a train, I don’t need more than ½ yard of fabric. She has Green eyes, so I wanted the fabric to have green or some color that works well with green. That would restrict me. Plan your shopping time – I knew I had workshops, meetings, seminars, luncheons and times I was meeting with friends. The showrooms were open only so many hours and one was at another venue. So my shopping time was limited to when a show was open and when I was free. I scheduled shopping into my schedule. Don’t carry all your money with you each time you shop. If it is early, you don’t want to spend it all in one place, and if you don’t have enough, you can leave a deposit and go get the balance. Swing around the showroom once or twice. If it is “to die for” buy it, but if there are more choices it will still be there. If it is not, it wasn’t meant to be. (Remember these are ways to be budget minded, not cruel.) Perhaps I am more disciplined. Remember I worked hard to save this money. Well, there is no five. I would love to have a five, but sometimes, you just have to have some fun and forget the rules. You’ll know when that is. Now we know, I bought green fabrics and trims and items that go well with greens. I bought them in lots that did not exceed ½ yard and I only shopped for about 4 or 5 hours the entire week. But I did break the rules (Number 5) and bought a whole yard of the dreamiest blue I have ever seen, and a wonderful pink jacquard. Am I nuts, maybe, but I don’t regret a single purchase since I got home. Did I go over my budget, YES I DID! I will tell you more about that coming up. After class I went to lunch, I really did like a salad at the hotel called, remarkably, Salad Bowl! It had all kinds of fresh spring greens, green beans, garbanzo beans (chickpeas), candied pecans, carrots, cucumbers and for a small fee a grilled chicken breast. Fresh bread and butter were delivered as a compliment. A tall glass of iced water and I was set. I had the pleasure of sharing a luncheon conversation with Barbara Marshall of the Toy and Miniature Museum of Kansas City. (http://www.toyandminiaturemuseum.org/) Just speak to the people around you I say, what a rewarding conversation that was. She is delightful. After lunch I registered to take pictures of the competition showroom and the special exhibits, attended a seminar of the Diversity of All Bisque Dolls, attended a meeting and sat in awe and watched as the items donated to the Bid & Bite auction went to enthusiastic new owners. P.S. I talked about the food in this one. Well, Monday was a fun day for me. I had not been scheduled for a workshop (though I tried for one) so decided to set off for another show that runs in tandem with the convention. This is called the National Doll Show. A free bus runs between the two venues so there is time to do everything. I met Nada Christensen in the morning and we set off to catch the bus for a fun day shopping. I snagged some gorgeous full length laces, and to die for colors in silk. And then I turned a corner, there before me was a booth that sold antique and vintage fabrics. (See the picture) The top fabric is green and black, 1860’s, the sheen doesn’t show, nor the fineness, so beautiful. The second with the dots, is 1830’s, can you believe it? It is VELVET, so fine and soft, feels like air! The third fabric is a vintage sheer gauze floral stripe. (Wonderful for my “large” 12” Ultimate Fashion®) And finally, the white is a dotted net. I longed to find a black one, but snagged the white anyway. 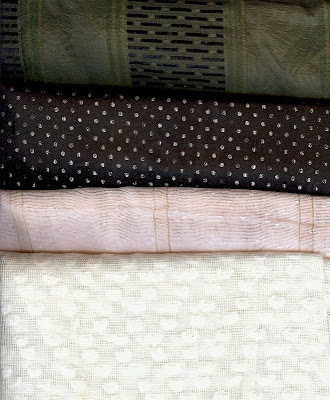 I am in love with these fabrics. Nada (pronounced NAY- duh) bought a wonderful antique milliners shop in 1/12th scale for her sales table at the UFDC convention. We missed our bus, so sat down and ordered lunch, visited and shared stories. We separated when we returned as she needed to finish setting up her sales table and I wanted to work on a sewing project I brought from home. Later that afternoon, I went to a table hostess meeting, a large opening ceremony where the announcements were made and the finally, the convention sales room opened. You guessed it, on to more fabric and laces. And I did buy more fabrics, from three more vendors, and more trims, and looked at more of the most gorgeous antique and modern dolls I have ever seen. What a wonderful event. Well, I was spent for the day and needed to chat with hubby and catch some shut eye before classes the next morning. Stay tuned for more about the convention and exhibits and workshops. P.S. did I mention the food was wonderful? See the picture from my room? Way up high. From this picture I am looking somewhat north. The two "hills" on the left are, I believe, Kennesaw Mountain and Little Kennesaw Mountain. I went to high school in Marietta, Georgia and dated my husband there. He's an historian by education and we had to go up Kennesaw Mountain, down it, up Little Kennesaw, down and ... well you get the picture. I had to read every tombstone and sign and listen to the battle as it happened. I married him anyway. But, I digress. The really COOL picture I took did not turn out. I caught a storm and lightening moving in at my window height. Another unnerving thing, a helicopter flew past a few days later. No camera handy then, but suffice it to say, I could have waved at him and he'd have seen me. Eerie. I must discuss the food. Delicious. Enough said. More about dolls and the convention coming up. I took some wonderful pictures and learned great things in workshops, attended a splendid luncheon and made lifelong friends. Stay tuned! P.S. I didn't watch TV at all. Well, I can hardly contain myself. I am going to the UFDC Convention in Atlanta. I leave Sunday and return home the following Saturday and I hope to have so much to report. I am sure I will have so much inspiration I will not know where to begin. Not to worry, however, I am taking some classes while I am there. I will be making a new bag for "my lady" to return with all her new finds and accessories. (Alice Leverett class) Then she will have a new place to keep all of her correspondence, a Papeterie. (Sherill Williams class) Finally, if I do not find her wig, Mary Zoch will be teaching me to make a new one for her. These ladies are wonderful teachers and I feel quite fortunate to take their classes. What will I be doing while not in class? Shopping, of course! There are showrooms with antique dolls, and vintage dolls and new dolls, and art dolls, and Barbie dolls, and Tonner dolls and soft sculpture and new born, you think of it and it will be there. There will be fabrics and trims and ribbons and laces, and oh, my I’m so excited. This is my first UFDC convention and I am delighted to be going. On Tuesday night, we are attending a bid and bite auction, and banquet at the end will be so enjoyable with all the new friends I am hoping to meet, and meeting up with old friends I have planned to meet. So, look for more news and more ideas, and hopefully more inspiration for all of us in the weeks to come.